Adopt a school for €600 (US$650) per year! Click here for more information. 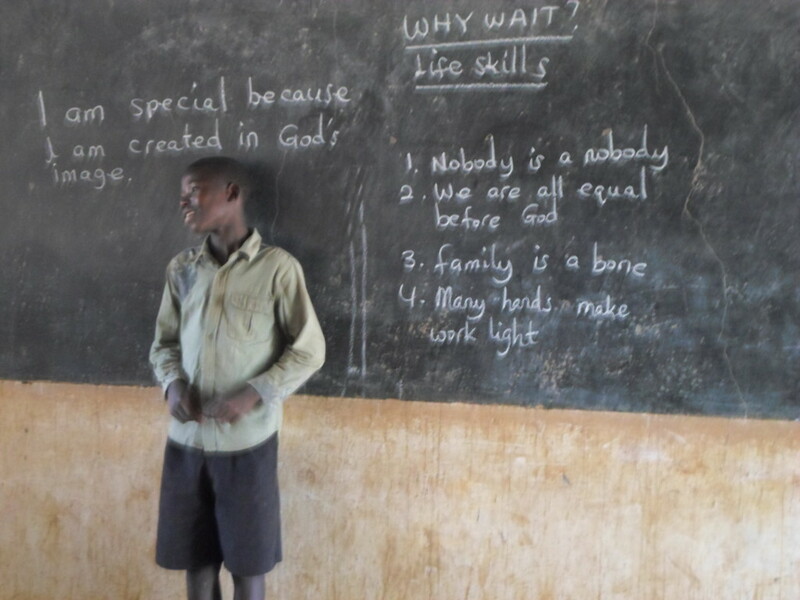 This boy is recalling some of the topics that his class has covered in standard 5 at Maveya Primary School. 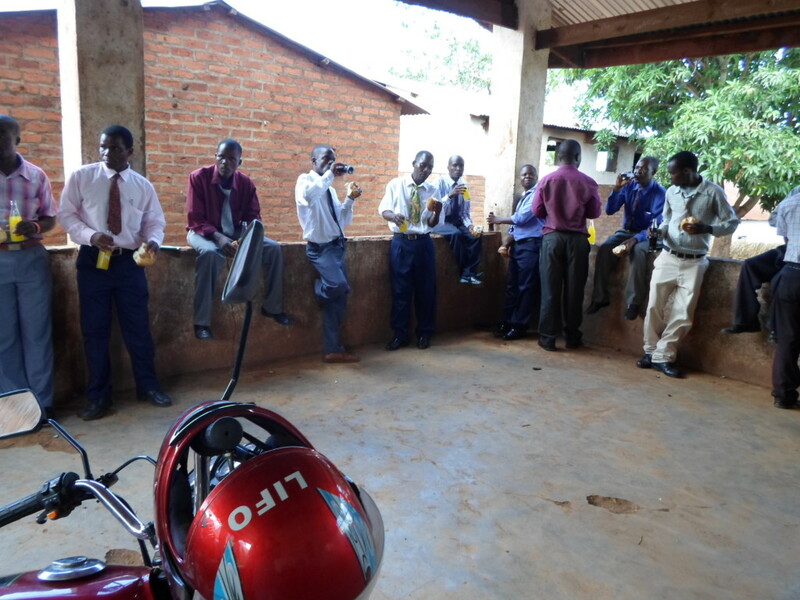 This was a revision session during a supervisory visit by FLAEM staff. Although Why Wait training sessions are busy and tightly scheduled, there is time for relaxing. Here teachers are relaxing over a bottle and snack. Teachers who did not know each other before develop new relationships. Why Wait refresher courses for teachers are very interactive. The courses are designed in such a way that as many teachers as possible participate in all activities. This is to train the teachers to do the same when presenting the lessons to the learners in their classes. It is always amazing to see the teachers humble themselves to role play different scenarios. 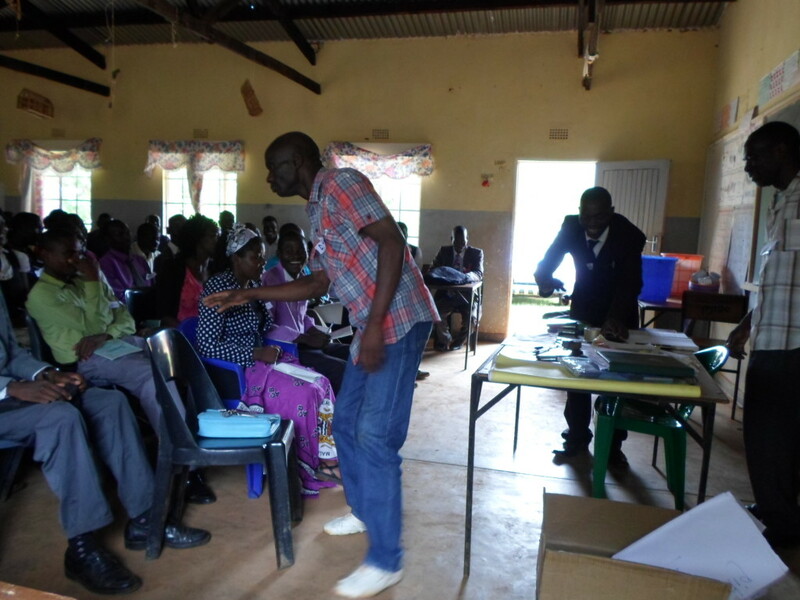 The photo shows head teacher for one of the schools (standing left) and assistant Primary Education Advisor (in suit) role play at the training at Maveya. looking at far away things (yes exploring). Teachers of Maveya Zone are here seen demonstrating the exploration exercise. discover some important things on their own. FLAEM believes in quality. Because of this belief, every year FLAEM organises refresher courses for the teachers who teach WHY WAIT in the schools where the project is being implemented. The refresher courses give the teachers from the different schools an opportunity to come together and share their experiences, challenges and successes in the implementation of the project. In addition to this, FLAEM staff has the opportunity to interact with the teachers as a group (usually FLAEM staff meet teachers in their schools during supervisory visits). 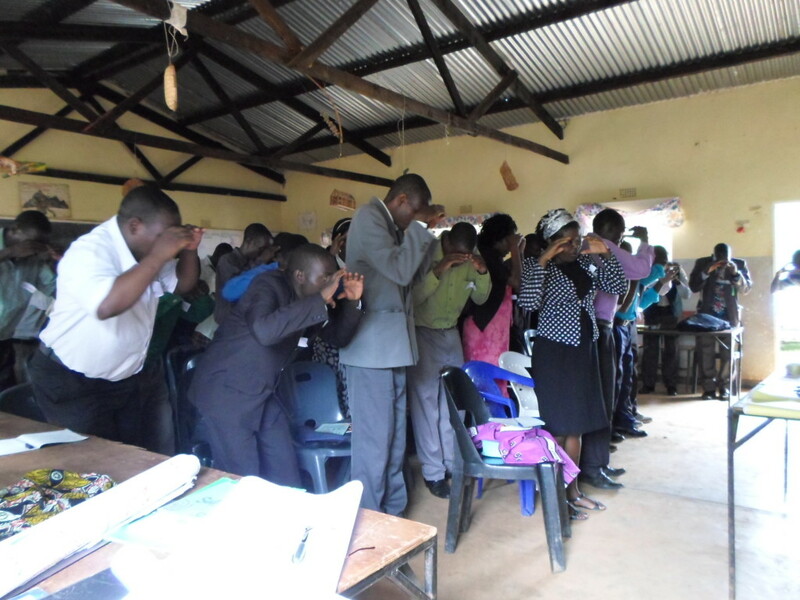 This year teachers from Chambe Zone had their refresher course from 22 to 23 December, 2015. 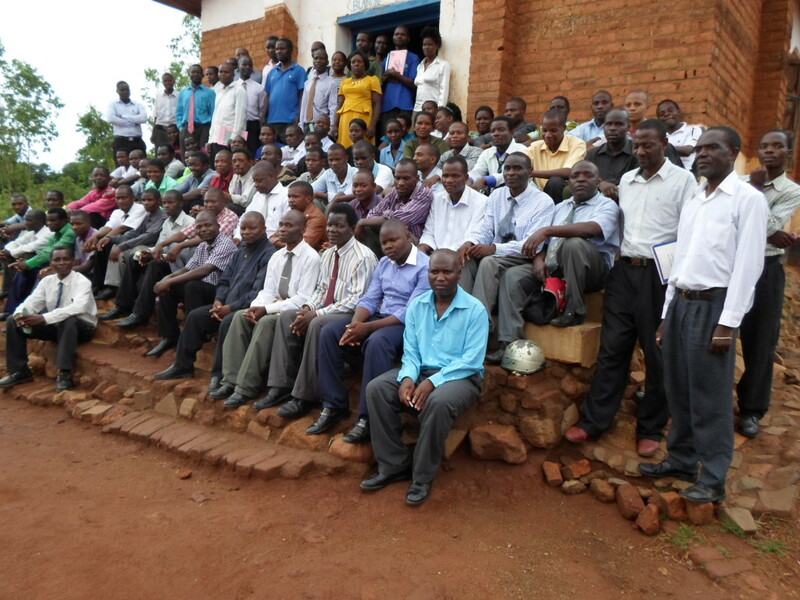 The course attracted 84 teachers from thirteen schools in the zone. In addition to refreshing those who had the opportunity to be trained in the past, some new teachers were also formally oriented. activities are implemented accordingly. The two Primary Education Advisors who attended the course, William Namakhula, and Jimmy Viliera, promised to continue supporting FLAEM. FLAEM is looking for more funds to run more refresher courses. Please support us by adopting a school. Participants to the refresher course. 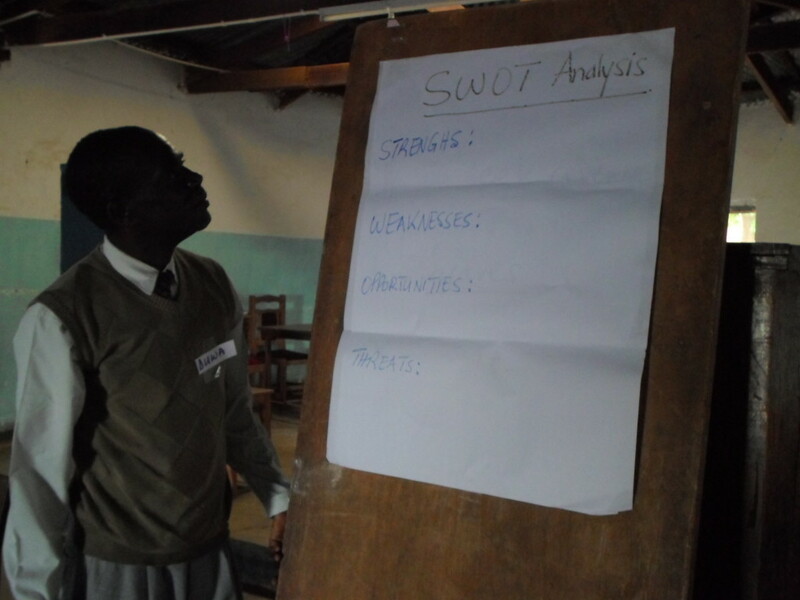 SWOT analysis was one of the topics during the course. One of the groups doing a SWOT analysis. 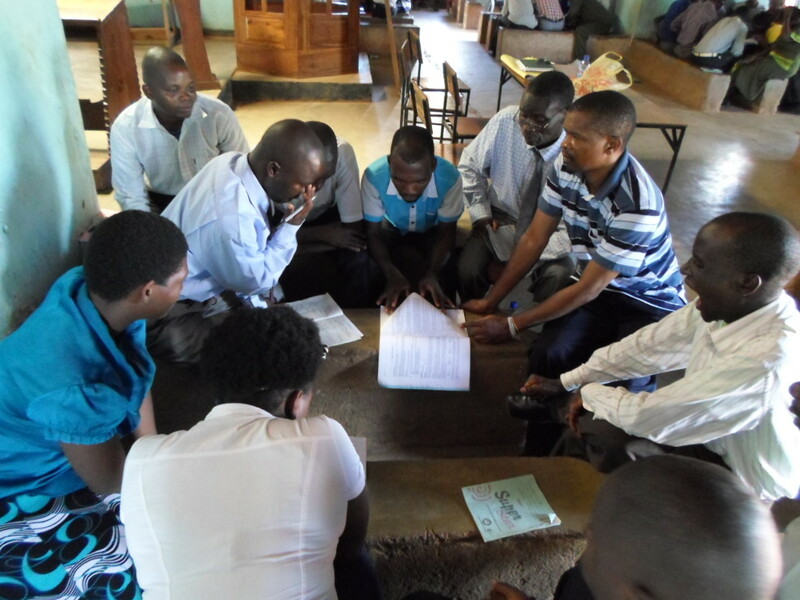 The District Education Manager for Mulanje, Mr. Gossam Mafuta, has recommitted to giving full support of the WHY WAIT activities. 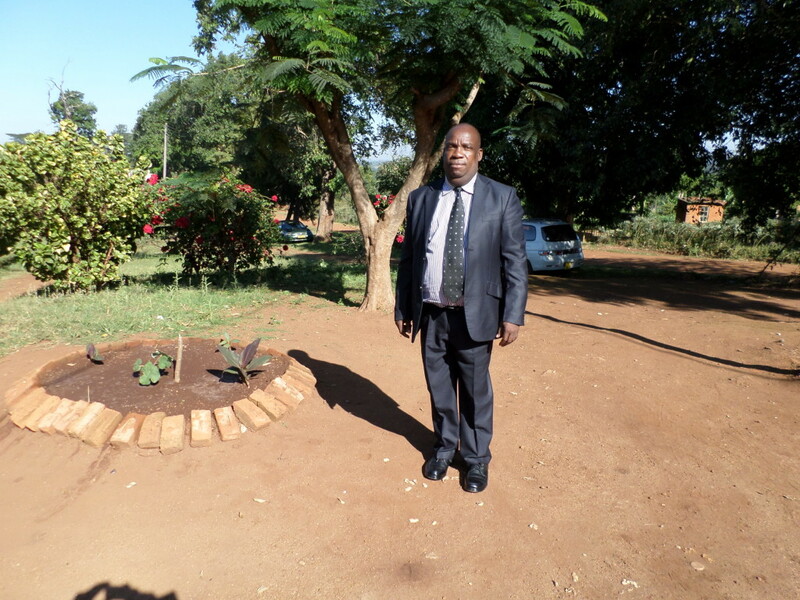 Mr. Mafuta made the commitment when Lloyd Khanyanga, Executive Director of FLAEM had a meeting with him. The aim of the meeting was to brief him on the work of FLAEM for the past academic year and also the plans that FLAEM has for the new academic year. 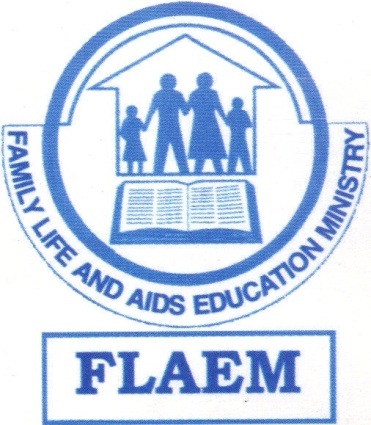 During the meeting, Mr. Mafuta expressed satisfaction with the work of FLAEM in the schools in Mulanje. He said that WHY WAIT is not only helping the learners but teachers too. He mentioned the fact that in the schools where FLAEM is working indiscipline cases for both learners and teachers have gone down tremendously. He further said that by training teachers who in turn teach the learners, FLAEM is using the best approach because the teachers will always be there even if FLAEM left. Mr. Mafuta also said that the moral aspect of the WHY WAIT approach helps the learner to get both education and wisdom. While satisfied with the work in the four zones of the district, Mr. Mafuta had one plea. He really wished FLAEM was able to reach out to all the thirteen zones in the district. He said this would ensure that all learners and teachers in the district “speak the same language”. We hope that the Lord will move you to respond accordingly to this plea by joining those who are supporting FLAEM. Mr. Mafuta is a seasoned educationist and for him to make these strong statements, we know he is really impressed and satisfied with the WHY WAIT programme. Please adopt a school to help make this dream a reality. As part of their social responsibility, Why Wait learners take part in different activities aimed at assisting the community. The aim of such activities is to ensure that the learners develop a spirit of helping others. Learners at Ngolowela took part is cleaning Ngolowela Health Post. The activities included sweeping around the post, mopping and digging a rubbish pit. 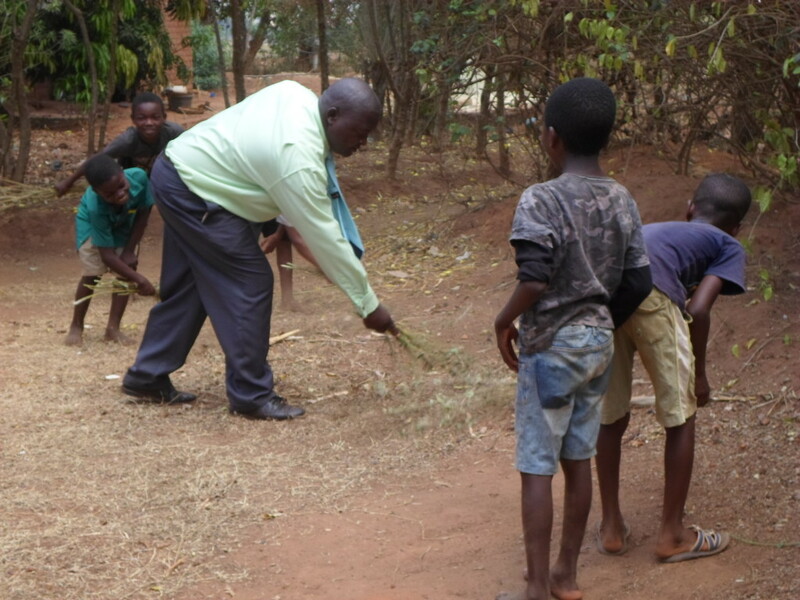 In the photo, the head teacher, Paul Mbendera, is sweeping with the learners at the health post. Why Wait Programme is attracting the attention of many institutions. One of such institutions is the Malawi Broadcasting Corporation (the national broadcasting house in Malawi). The attraction comes because of the unique content and approach of the curriculum. 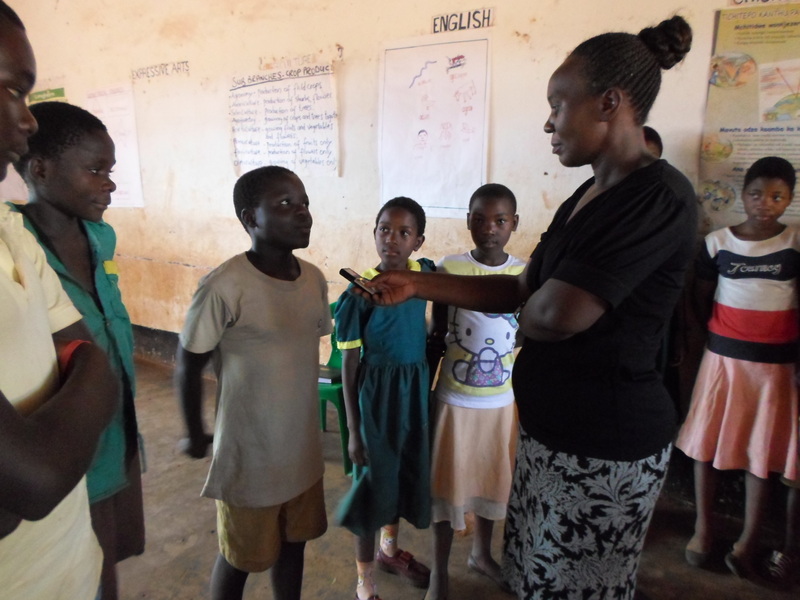 In this photo, Yapatula Nyirenda, Head of Christian Programmes at Malawi Broadcasting Corporation is seen recording a programme with the Why Wait learners at Ngolowela Junior Primary School. There are so many things that we take for granted. When we greet somebody we may not realise the impact such a simple act may have on the person. Basic as it may seem, greeting someone says a lot to the person. The person feels valued and important. On the other hand, not greeting someone sends a very negative message to the person. It is like saying to the person “You do not exist”. Why Wait teaches learners to appreciate such basic acts bearing in mind that “Nobody is a nobody”. 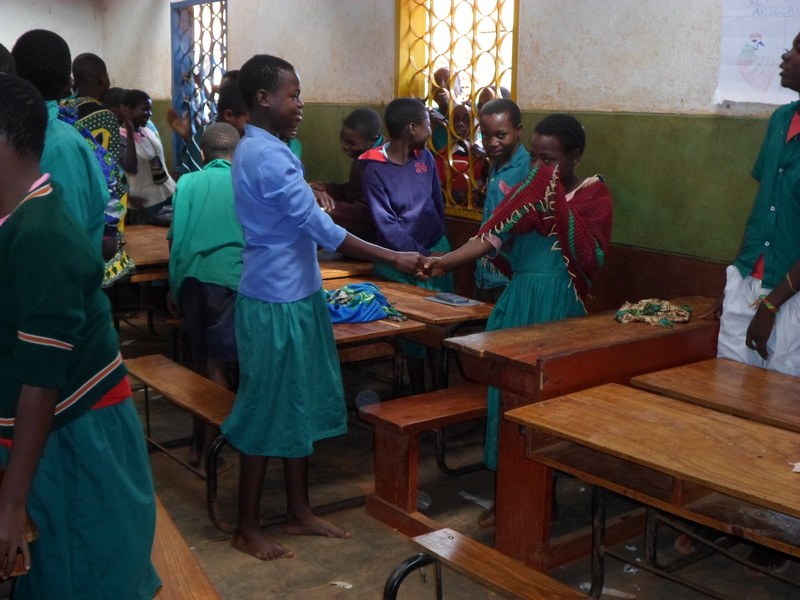 In this lesson, learners were practising this basic but very important act of greeting each other. 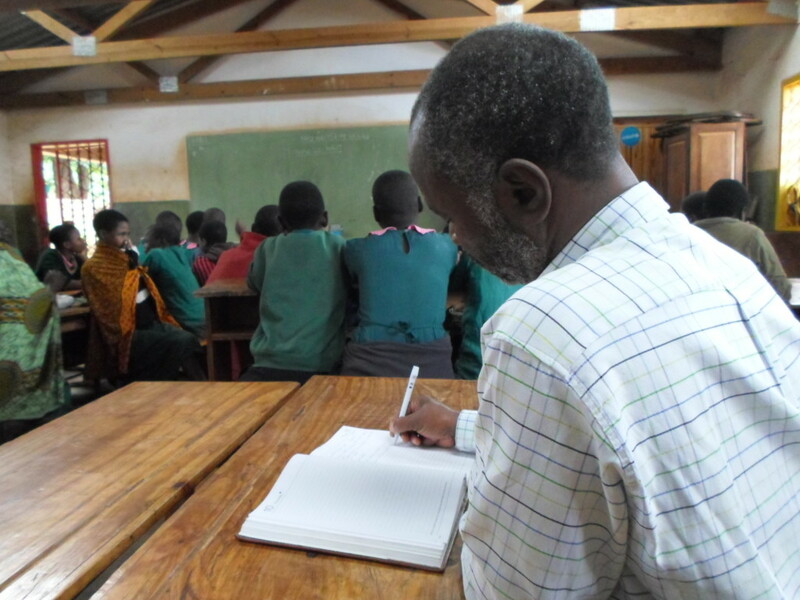 During supervisory visits to the schools, FLAEM Executive Director, Lloyd Khanyanga, observes lessons. Apart from verifying that teachers really present the lessons they claim to have presented through the monitoring forms that they complete for every lesson, he also takes on what the teachers do e.g. the presentation style, content and many other things. At the end of each lesson he discusses with the concerned teacher. This is aimed at encouraging the teachers on the things they do well and assisting the teachers to improve on any noted weaknesses. Teachers appreciate this. In this photo Lloyd is taking notes during a lesson.